The attorneys at Ronemus & Vilensky prepare each case as if it were going to trial, whether it does or not. If the insurance company does not offer a fair settlement, we will be prepared to try the case in court. This strong, dedicated position has earned us a formidable reputation among defense firms and insurance companies. Hard work, thorough preparation, excellent trial skills, and years of experience, paired with cases that merit substantial compensation is the winning combination that enables Ronemus & Vilensky to procure millions of dollars for our clients. 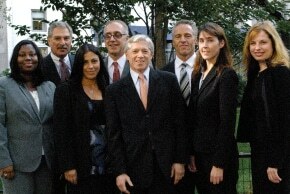 The attorneys of Ronemus & Vilensky specialize in representing clients with the following injuries: Erb’s palsy, cerebral palsy, traumatic brain injury, lead poisoning, hospital or physician malpractice, racial or sexual discrimination, construction accidents, motor vehicle accidents and other types of serious accidents, false arrests, and police assault or abuse. If you have a case that you would like to discuss, please feel free to contact the attorneys at Ronemus & Vilensky. We will keep all information strictly confidential and there is NO CHARGE for a consultation. In fact, every case we take is on contingency, which means you don’t pay any attorney’s fees unless Ronemus & Vilensky wins your case for you.